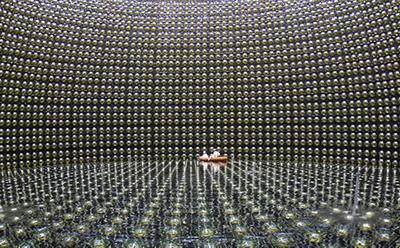 The University of Southampton is to play a crucial role in two new multimillion Euro projects that will expand on the research on neutrinos, which led to the Nobel Prize in Physics 2015 being awarded jointly to Takaaki Kajita and Arthur B McDonald. Southampton researchers are set to continue their involvement in the award-winning European Innovative Training Network (ITN) Invisibles: Neutrinos, Dark Matter and Dark Energy with the announcement of two new major funding streams. ELUSIVES is a €4m ITN network that aims to understand the nature of the most elusive particles which make up the universe, particularly neutrinos and dark matter particles. InvisiblesPlus is a €2.5m RISE Network that will facilitate a worldwide network of internationally-recognised researchers from physics and astronomy and mathematics. Southampton scientists from across Physics and Astronomy will be contributing to the work of these projects by providing unique expertise in neutrino theory, cosmology, and flavour and charge parity violation. Professor Steve King, who will lead the two Southampton groups, said: “We are delighted to be involved in both of these networks and hope that our research will help shed light on major questions such as the origin and nature of matter in the Universe. “To achieve funding for one major European Union network is a great achievement, but to be funded for two such networks in such quick succession is, in my experience, unprecedented. Together these networks will pick up from where the Invisibles network will finish in April 2016 and will run in parallel for four years providing great opportunities for Southampton researchers."